Where is the line between where an app is simply an amusing novelty, to where it becomes an actual workable, useful tool for helping improve your golf game? This is a very valid point nowadays given the sharp increase in the number of golfers who are using apps either out on the course, on the range or even at home to record and analyse many different aspects of their game. Is all this work ultimately fruitless? Are amateur golfers now shooting much lower scores and showing much greater on course knowledge due to them keeping a record of their scores or swing on an iPad? In the past, most amateur golfers will know that any ‘miracle fix’ for a golfing problem was usually far from that and often just added to the frustration. So in Gorilla Golf’s never-ending quest to bring you all the latest in the world of apps, were going to look at how someone, (me), has used these apps to successfully improve their golf game and in short, despite downloading and testing many different apps over the last year or more, I’ve found that only THREE types of app, I believe, have had a positive effect on my game. I’ve found apps have helped my game develop in three key areas; judgement of distance, putting and on course knowledge. Without doubt, the biggest benefit I have felt I have achieved using apps to my game is the increase in the accuracy with which I can predict distances plus (and this is absolutely vital) which club in my bag I need to use to hit the ball that distance. 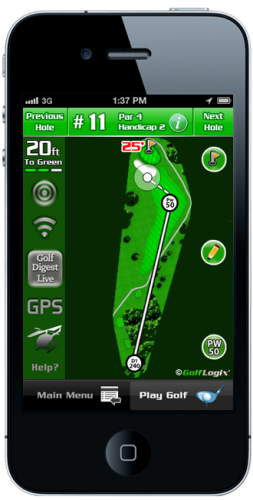 GPS systems on Apple and Android devices or similar have allowed app developers to use this information to use your device as a rangefinder. Rangefinders are not new of course, there are many good models that have been around for many years, but what the best apps do, like GolfLogix GPS, is not only measure the distance, but record real-life data on how far you hit your clubs in the bag. This is absolutely vital. An amateur golfer like me may know that it is 170 yards to the green from where my ball is, but a combination of a lack of knowledge, vanity or just sheer bloody-mindedness means that we’ll often think to ourselves that we can hit a 6 or 7-iron that distance, only to find that we often come up well short. I was certainly guilty of this on many occasions but I have found that over time (and the longer you use an app for this purpose, the better) by recording the distance of each shot I make with each club in the bag, I am now far more confident of club selection when it comes to any shot. Of course, the GPS in my phone tells me how far the green is, but I now know that a 200 yard shot requires me to use one of my hybrid clubs, I also know that for ‘middling’ shots of between 145 and 155 yards, that I am better using a steady 7-iron, than I am trying to hit an 8-iron with extra power. The net result of this collection of data means that nowadays, I rarely leave an approach short of the green compared to what I used to do. I also know that my ‘guestimations’ of how far I hit each club were WAY out compared to the real data I’ve collected. It is enlightening for a mid-handicap golfer to have this information readily available and I think it is having a significant positive impact on my game. In short, I now hit shots knowing I am using the right club for the required distance, not hoping it is the right club for the distance. It is one of the strangest dichotomies of golf that for most players we take between 30 and 50% of our shots on the course with a putter, but it is often the least practised club in the bag. I was certainly guilty of this and at the range, my putter would often stay firmly in the bag while I worked through almost every other club. It is only through analysing just how many shots I was leaving on the green due to poor putting by using the data collected by apps that I realised that I (and I am willing to bet most other amateurs) could potentially save at least a couple of strokes each round if I just got a little better. 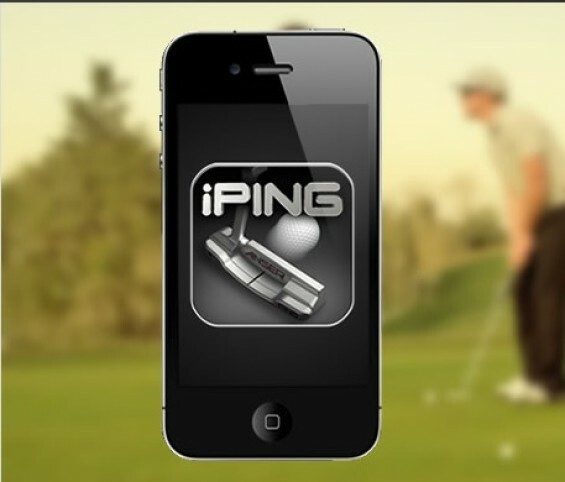 To that end, I found the iPing Putter app invaluable. At first, having the small cradle and your phone attached to your putter looks cumbersome and you’ll even try to convince yourself it is ruining your putting stroke. I did, but persevere with it. You quickly get used to it and in reality, the difference you feel in the swing is likely to be all in your own mind. The data you receive however when you hit your five putts is invaluable, the app measures previously unseen data like club face angle and uses the data it collects to help “train” into you a more consistent putting stroke. I can’t say this app has helped me hole regular 30-footers, but what it has done is made more more accurate from killer distances, six feet and in and I reckon has helped me save at least a shot or two on the greens in each round I play. One of the ways my game has improved over the past year, which my playing partners have commented upon is simply my on course knowledge. I’ve found the handy app provided by the R&A that can download the entire Rules of Golf document to your phone useful, but in addition I have also looked at many courses that have developed their own apps. This is a growing market for many private courses. Players visit and download the app onto their phone and then can consult the app for a variety of reasons, such as checking any local rules, or if they are in a tournament what the current score is (as this is update in real time). Now, if a ball has been chipped out a bunker, hit a rake being held by an opponent and bounced back into the trap, I have clear advice on what to do in this situation at hand. So that’s how I reckon apps have helped me improve, I’d be interested in hearing how you think they have improved, or hindered, your game! I just want to say how much I enjoy this information. Interesting, clear and precise. Very valuable information Ian.